Courtesy of the Chester Courant, below is a foolproof guide to the Regency rake’s perfect night out… Ladies, if you’re looking for Mr Darcy, you’re in the wrong place. You must be a buck; that is, you must be impious in your morals, wanton in your debaucheries, and horrid in your imprecations: in every thing that has the least alliance with obscenity and lewdness, or in short with any kind of wickedness, you must be learned; in every thing else, you may be as ignorant as you please. A Blood is just such another empty-headed fellow. – Whenever you go to church, (as you may now and then, when you have no where else to go) you must try every means means to let the congregation see that it is not devotion, but curiosity, that brings you there: Never look at the parson, but at all the fine girls; and to make yourself the more remarkable, pull on your glass, and stare at them. You must know, or pretend to know, all the young ladies in town; and should you discover any one, two, or three of them to have conceived an affection for you, you must endeavour to debauch them all; and if you are so happy as to succeed, you must then forsake and expose them, by way of gratitude for their kindnesses. You must often go to the playhouses, and there always distinguish yourself as highly as possible in assuming every freakish air and saucy attitude… You must go to taverns and coffee-houses, and jelly-houses and bawdy-houses, where you must commit every kind of tumult and disorder, such as jumping about the rooms, and putting out the candles, spilling the liquors, breaking the glasses, kicking the waters &c &c.
Image (top): ‘A Society of Distinguished Painters’ by R. Ackermann (1837). Refers to the ‘Spree at Melton Mowbray’ during which the Marquis of Waterford and friends entertained themselves after an evening of drinking by literally painting the town red – including this disgruntled toll keeper’s house. 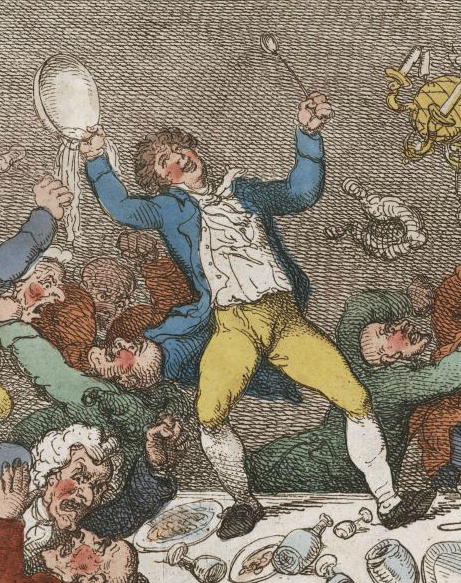 Image (bottom): Detail from ‘The Harmonic Society’ by T. Rowlandson (1811). I hope they made a good job of their house painting exercise! sounds like a night out with our local rugby team.